here was 2008, walking and stumbling on these shadowfeet. I've been changing to be less and less asleep, made of different stuff than when i began. Definately made of different stuff than when i first began. Too much has been going on recently till a point that felt like dropping it all and disappearing off to somewhere else..far away from the noise and sinking thoughts. But thats only for cowards i guess. This year was also a year of letting go of everything..literally. Things, people, places, incidences and emotions. I've being doing so much of letting go until i feel that i didnt want anything anymore. I dont want anything!! 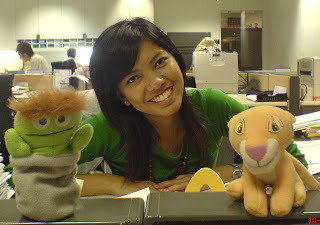 Coz i know i'd have to let go anyway..
so.. things that i want to thank God for 2008..
1. Good exam results.. this is a miracle! Through the ridiculously tight schedule of classes, visitations, cgs, and family..God still came through with me~ gilaaa chun! 2. WHC Children Ministry that has FINALLY become a Children Church!! wooohooo Thank God for every child, parent, teacher, helper, worship leaders and musicians that He had brought into this place. 3. WHC Youth Ministry> The Metamorphosis Project.. that the children that are growing into the teens now have a larger group to grow with and wonderful leaders to lead them to becoming super lovers of Jesus. 4. Open doors> ooportunity to serve with World Vision. More to come babe! 6. My holiday job at Scotiabank.. great boss, great collegues, great experience! 7. My sis is going home to stay once a week! 8. Thank my grdma and aunt for sacrificing so much to let me go to love others. 9. Mummy, just for being my mummy. 10. Friends, that have been there although they don't and maybe will never be able to understand what has been going on with me. That they don't judge me for mistakes but give grace and support. 11. People who i have regarded as unofficial mentors.. ie Ps. Ong! that have spoken many truths into my life. 12. Challenges that have made me stronger. 13. Victories that have excouraged me to do better. 14. Thank God that He nudged me let go all those stuff that would have prevented all those things above to work out..
5. to find the best in others and to praise them loudly for it. 6. to make the world a better place whether by a happier child or senior person or a redeemed social condition. 7. to know even one life has breathed easier because I lived and loved. 8. to love generously as how Jesus would. 9. to live fully the life God created me to live. I thank God for loving me and for teaching me to love others more and that life goes beyond just yourself. here is 2009, full of faith, hope, love, expectation, enthusiasm, peace and joy! I;m coming to GET YOU! yah...let it be an awesome 2009 this year! i really really like this post :) especially the resolutions. May you have a blessed, blessed 2009. One that is blessed far more beyond your expectations because He is a God who can do so much more than our finite mind could ever hope for, expect or imagine :) Hope to see you again someday soon!